Where: Netherlands Architecture Institute (NAi) at the Architecture Biennale Rotterdam and Architecture Biennale in Venice in 2008. 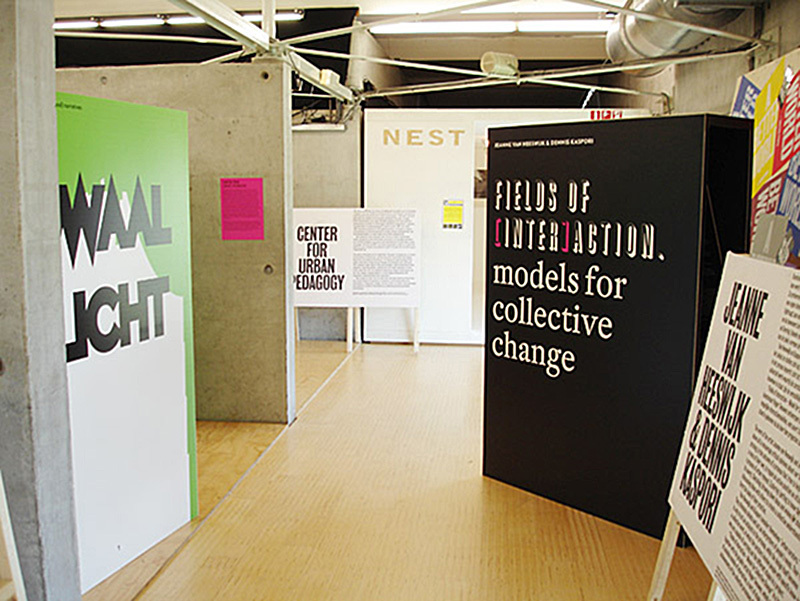 Exhibition design for 'Fields of [Inter]action', part of the exhibition ‘A better world, Another power’ in the Netherlands Architecture Institute (NAi) Rotterdam, at the Architecture Biennale Rotterdam. Fields of [Inter]action is an exhibition of 5 projects of artists Jeanne van Heeswijk and Dennis Kaspori. The exhibition encourages participants to take a critical stance towards our constructed environment. The exhibition concept is derived from a life sized pop-up book, by which a urban environment is being presented and where the visitor can experience the different scenarios and changes. Designed during internship with graphic designer, Roger Teeuwen, in collaboration with Sjoerd Dekker. This exhibition also travelled to the Architecture Biennale in Venice, 2008.